What if four-strokes had disappeared from the face of the earth back in 1998? What would a factory two-stroke look like in 2019? 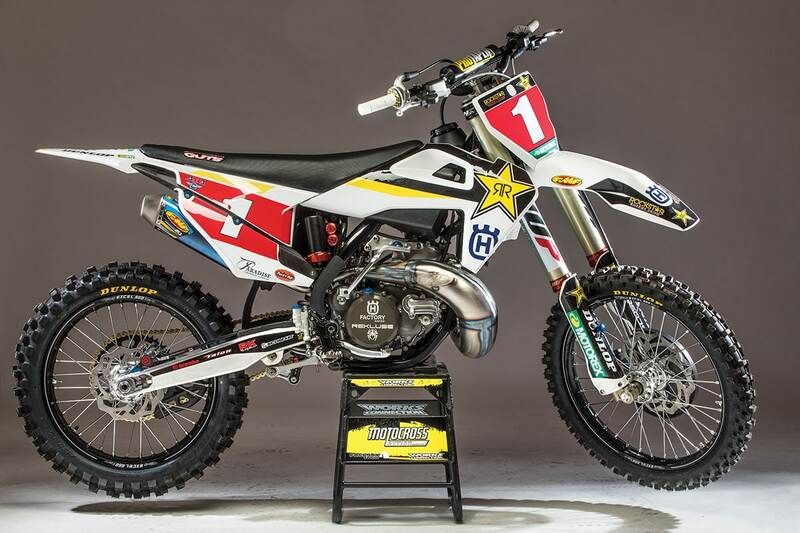 After Jason Anderson won the 2018 AMA Supercross Championship, his Rockstar Husqvarna team decided to build Anderson a true-to-life factory Husqvarna TC250 two-stroke. Why? Why not. They wanted to incorporate as many factory parts from Jason’s FC450, as well as build some for the smoker itself. This is not Anderson’s first two-stroke or first two-stroke project with MXA. Back in 2016 Jason did a TC250 two-stroke video for the MXA New Year’s series that went viral. It had over 1,300,000 views. Since we did the video at the Baker Factory in Florida, we did not actually ride that two-stroke. This time Husqvarna wanted us to not only shoot a Jason Anderson TC250 video, but they also wanted us to test his all-new two-stroke as well. THE GEAR: Jersey: Fox 360 Kila, Pants: Fox 360 Kila, Helmet: Fox V3, Goggles: Fox Vue, Boots: Fox Instinct. Watching a Champion-caliber racer ride a factory two-stroke brings back so many warm and fuzzy feelings. Hearing Jason wring out the smoker was music to our ears. After Jason put in a few motos on the track, the MXA wrecking crew got to throw a leg over the factory smoker to test it out. Although it wasn’t easy for our test riders to follow the opening act, we reminded our testers that this was the most high-tech, full-race two-stroke in existence—and that we should refrain from crashing as often as we usually do. The 2019 Husqvarna TC250 two-stroke in stock trim has an abrupt, hard-hitting powerband that lights up the rear tire almost instantly. This makes the TC250 a handful to ride, unless you have a steady and precise throttle hand. 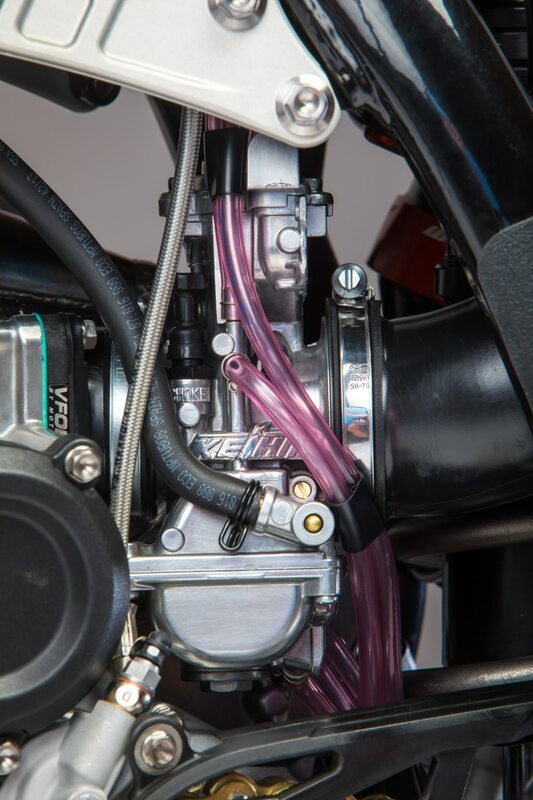 With the production model, most MXA test riders de-tune the stock version with taller gearing and careful power-valve adjustments to smooth out the power to the ground. Jason’s full-race TC250 had a ported cylinder, milled head and Moto Tassinari VForce reed cage. Instead of the stock 2019 Mikuni TMX it used a Keihin carb from the 2016 model. ENGINE: Jason Anderson’s factory smoker had a powerplant that was faster and stronger throughout the entire power curve than the stocker. Most notably it delivered a free-revving feel. The subtle changes to the engine stretched out the low-end torque, making the bike have a linear feel that put power to the ground easier for a more controllable ride. Rockstar Husqvarna cut no corners in hand-building the engine on Anderson’s TC250 two-stroke. The engine produced power in all the right spots, but not so much that it became a handful. It was an engine that was easily adaptable to either rev the bike up or leave it in third gear and let go. CARBURETOR: The standard Mikuni carburetor is known to be quite finicky on the TC250 two-stroke and has to be run with the recommended 60:1 premix ratio rather than the normal 40:1 gas-to-oil ratio. On Jason Anderson’s bike, the Rockstar Husqvarna race team switched back to the old Keihin carburetor from 2016. When riding the bike, we noticed no hesitation off the bottom or hiccups in the midrange, which gave us confidence going up to jump faces, and attacking the track knowing the power was there when you rolled the throttle on. THE SHOCK HAD A COOL, SQUATTED FEEL WHEN SITTING ON THE BIKE. WHEN RIDING THE BIKE, ANDERSON’S TC250 WAS PERFECTLY BALANCED AND HAD A NICE SUBTLE FEEL ON LEAN ANGLES UNDER ACCELERATION. 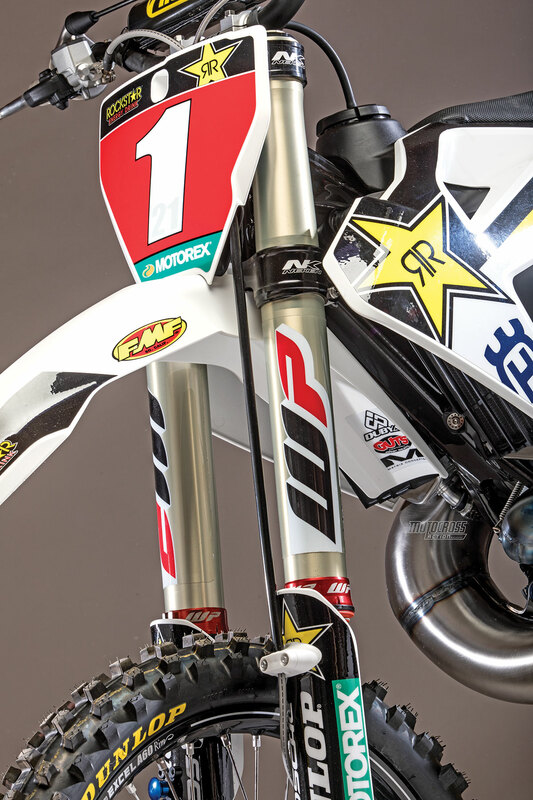 SUSPENSION: Riders have a love/hate relationship with the standard WP AER air forks. Jason Anderson’s bike had 52mm Works WP spring forks that were not overly stiff and had a good rider-friendly feel that a Pro or a fast Intermediate could enjoy. A lot of factory riders’ suspension is not ridable for the average joe. Jason’s forks had a plush feel that allowed us to use all the travel without fear, because the bottoming resistance was very consistent. Front-wheel traction with the 52mm Cone Valve forks was superb. 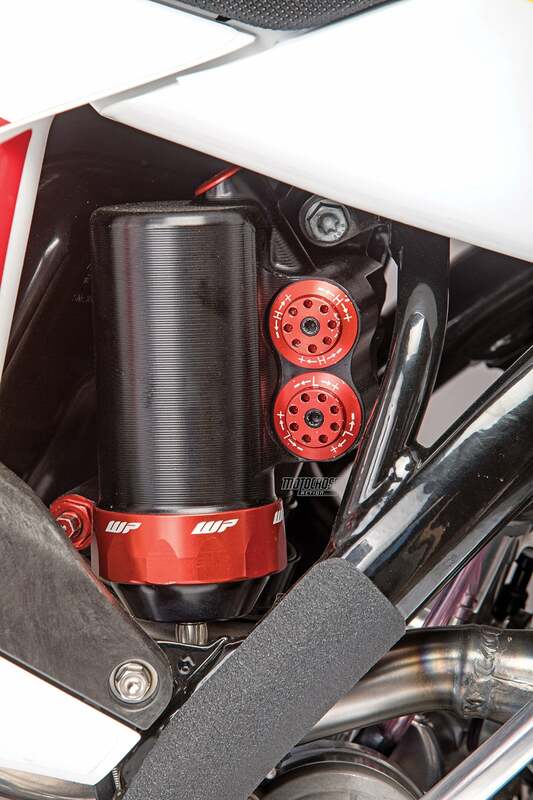 While the standard WP shock works well for most local riders, for a rider like Anderson, it would be under-sprung and under-damped to hold up to the speeds he travels. 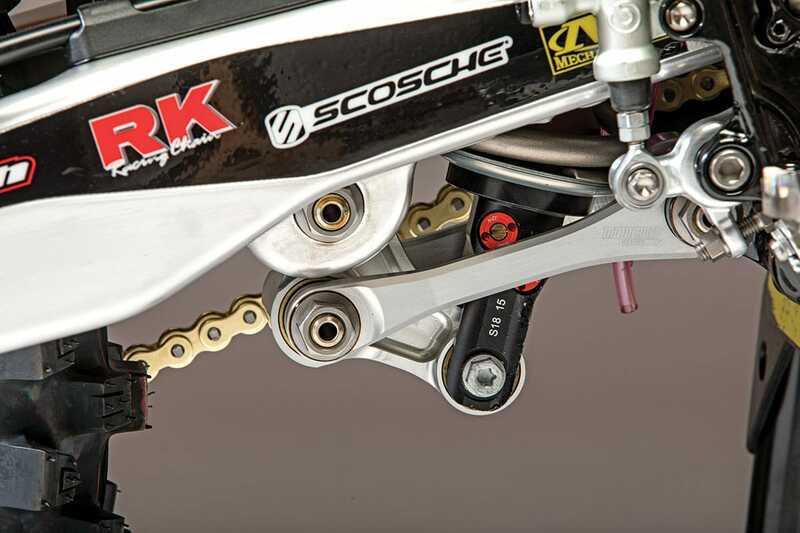 The Factory WP shock with a works link arm had a fair amount of movement in the initial part of the stroke, but it’s enough to hold the rear up to allow the bike to track well under acceleration and not G-out on jump faces or landings. The shock had a cool, squatted feel when sitting on the bike. When riding the bike, Anderson’s TC250 was perfectly balanced and had a nice subtle feel on lean angles under acceleration. Jason’s Husky TC250 had uber-stopping power thanks to works Brembo brakes on the front (above) and rear (below). Note the CNC caliper carrier bracket on the rear and the beefed-up lugs on the forks. BRAKES: The standard Brembo brakes are some of the best in the game. Anderson’s factory Brembo brakes were more accurate and could be easily adjusted to deliver the brake feel the rider was looking for. 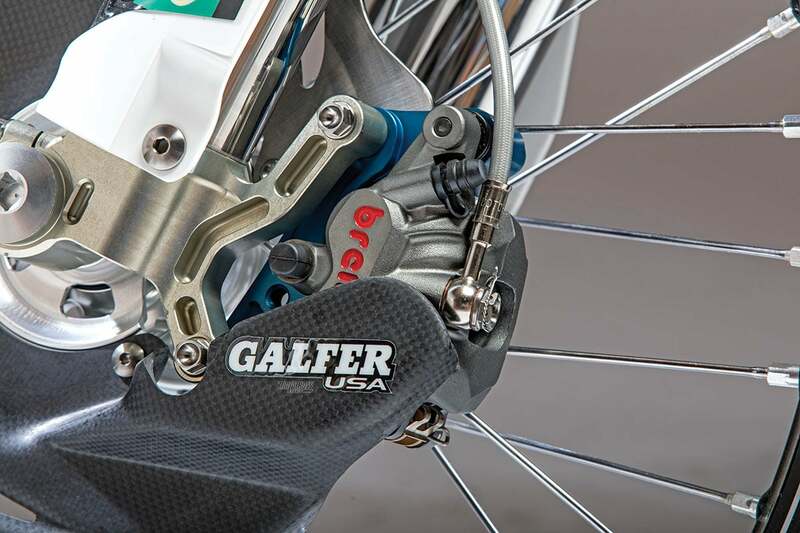 Anderson’s works brakes didn’t necessarily have more pucker power—just vastly improved modulation. Dragging the brake through the turns and stopping quickly were made with less effort and minimal input. The rear brake was very sensitive, and Jason runs his rear brake pedal above the footpeg height, which made it easy for our test riders to lock the rear wheel up to make sweet brake-slide turns. 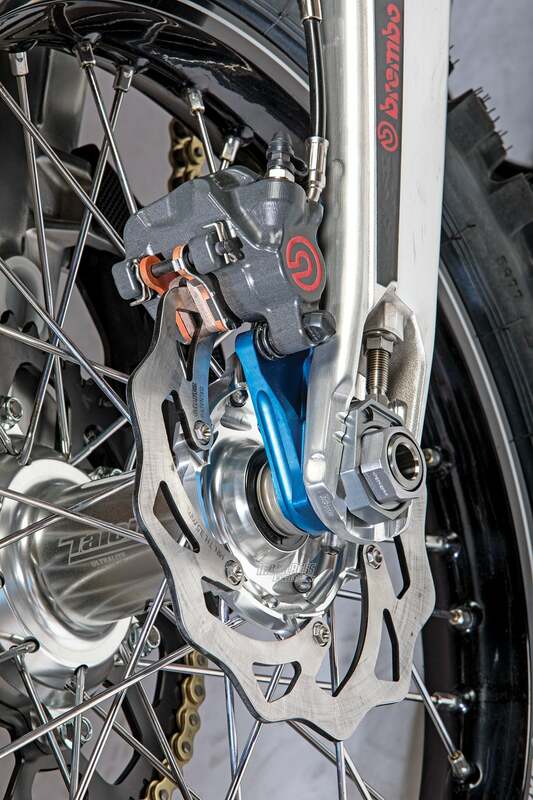 The swingarm is stock (above), but the rising rate linkage (below) is a works part. CLUTCH: The standard 2019 Husqvarna TC250 comes with a Magura clutch assembly. Jason’s TC250 was equipped with the complete Brembo clutch assembly, which had a nice engagement feSETUP: Jason Anderson’s setup on the factory TC250 two-stroke was a massaged and fine-tuned version of the stock TC250. A few notable parts: Jason prefers a soft seat, which was built for him by Guts Racing for his liking. His Pro Taper handlebars are a little higher than the standard bend with a fairly neutral positioning. His levers are about where the average rider would like them. JASON ANDERSON’S WORKS 2019 HUSQVARNA TC250 TWO-STROKE IS THE KISSIN’ COUSIN TO THE HONDA FOUR-STROKES THAT MECHANIC DAVE ARNOLD MADE FOR JOHNNY O’MARA AND RON LECHIEN BACK IN THE DAY. “Dials? We don’t need no stinkin’ dials.” The WP works shock has enough dials to go around. PATINA: Building a factory bike requires more hours than most people would think. Switching Anderson’s TC250 from standard bolts to titanium bolts, along with polishing the swingarm, took 10 hours to get the perfect factory look. All the little details of torquing bolts, greasing moving parts and customizing the standard parts to Jason’s likings are what make factory bikes so factory. And, we don’t get to see that many factory-built 250cc two-strokes anymore. 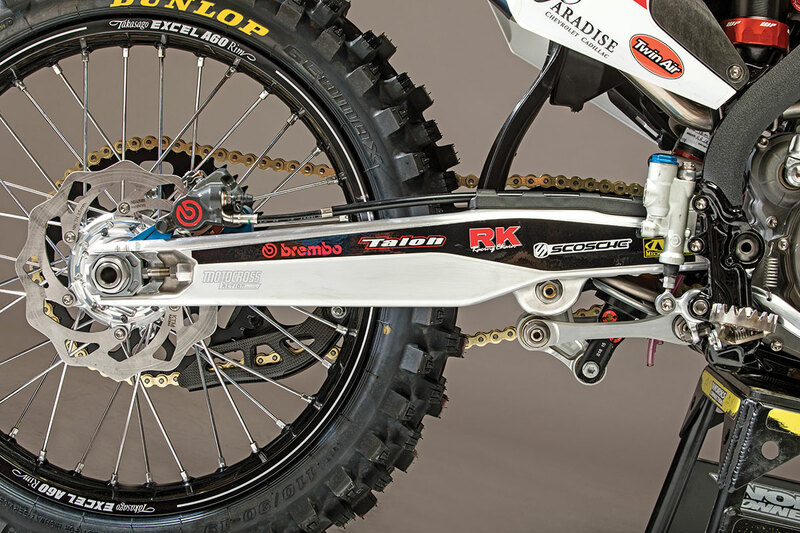 The 52mm works Cone Valve coil-spring forks replace the stock 48mm AER air forks. These are the same forks that Jason uses on his Husky FC450. WHAT DID WE REALLY THINK? The MXA wrecking crew has been testing factory bikes since the early 1970s. 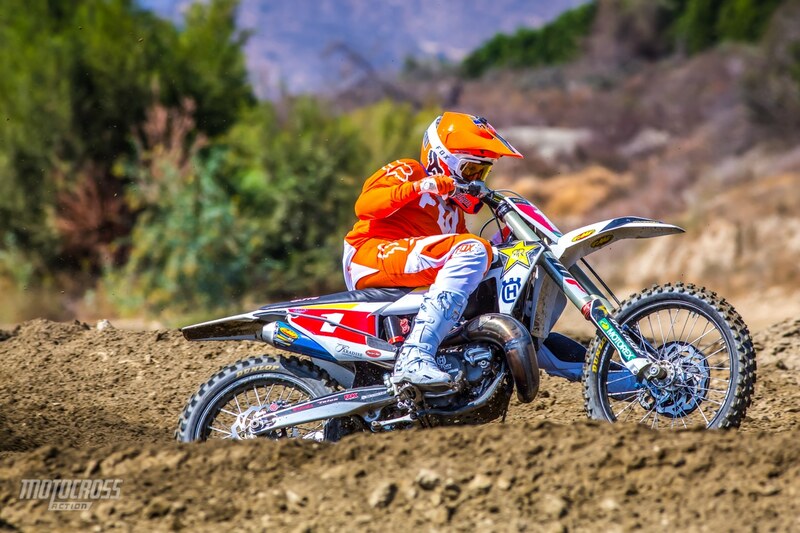 Every red-blooded American motocross racer would have laughed at us 40 years ago if we told them that someday the four-stroke would dominate the sport. In fact, 40 years ago the factory mechanics built special one-off four-strokes for their riders to play on. In lots of ways the times may change but still stay the same. Jason Anderson’s works 2019 Husqvarna TC250 two-stroke is a kissing cousin to the Honda four-strokes that Dave Arnold built for Johnny O’Mara and Ron Lechien back in the day. If four-strokes suddenly became extinct, we wouldn’t have to look very far for their successor. Anderson’s TC250 would be on the top of the podium. It is a thing of beauty that runs as good as it looks. We appreciate the opportunity from Husqvarna and the Rockstar team to ride the bike that Jason Anderson would be racing in the 2019 Supercross season—if four-strokes never existed. We can dream, can’t we?